This article explains how each of these three systems work, and how to use them in the most effective way when driving off-road or in challenging conditions. 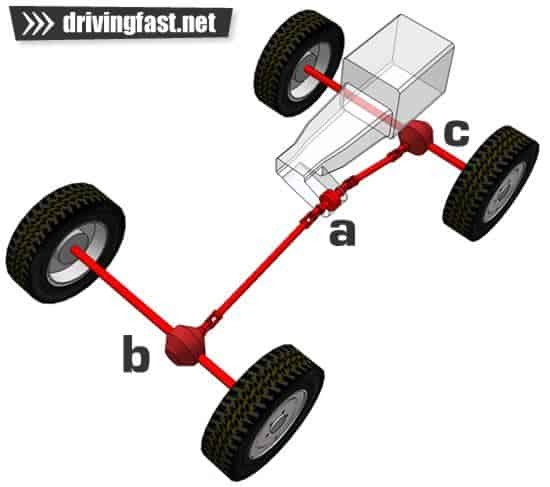 Permanent four wheel drive systems all follow the same principles, although the mechanical layouts can vary. Firstly, the drive (which exits the engine via a drive shaft) needs to be split in order to power the front and back axles simultaneously. This is done via a mechanical gadget called a differential. 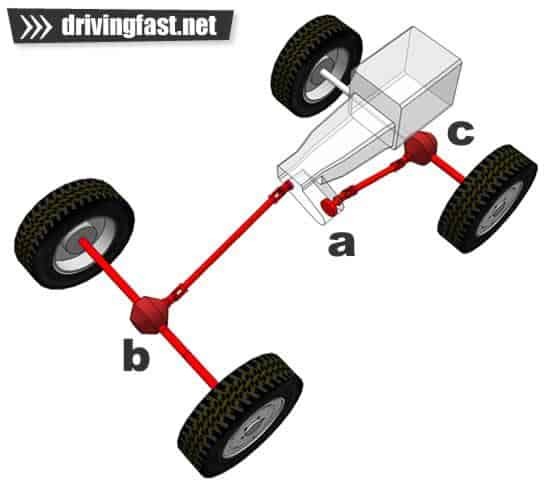 Full time four wheel drive systems have a centre differential (a), as well as a rear (b) and front diff (c) shown in Figure 1 below. The front and rear diffs split the drive to the wheels, and this is how all four wheels can be powered by a single engine. Differentials allow the drive to be split, but they also have another function, which is to allocate drive to each wheel in a flexible manner. When turning corners, each wheel takes a different path (see Figure 2). The inside wheels take a tighter arc than the outside, and in addition the front wheels take a slightly different path than the back. To allow this to happen, the same differentials which split the drive must also be able to distribute the drive at different speeds while maintaining forward propulsion – a tough job for one component. This is all well and good, however this flexible approach to distributing drive has a side effect – it allows drive to ‘escape’ via the easiest route. Let’s say we’re driving a front wheel drive vehicle on a tarmac road, but one of the driven wheels is positioned on frictionless ice. 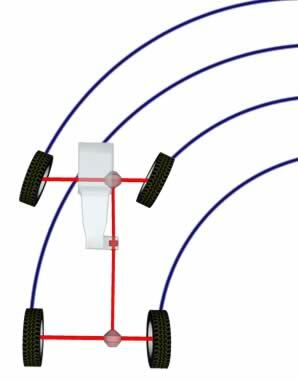 When the driver tries to pull away they would find the wheel on ice spinning wildly, but the wheel on tarmac would not rotate forwards to propel the vehicle. 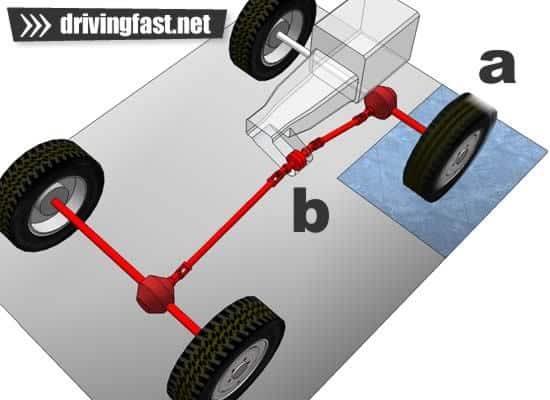 This same principle applies to permanent 4WD cars – the flexible division of drive provided through the three separate differentials can prevent forward motion from occurring if just one wheel is on a slippery surface (a, Figure 3). This situation is far from ideal, especially as four wheel drive is meant to provide better performance in slippery conditions. But there is a solution – locking differentials and traction control. Most full time 4WD vehicles are fitted with a locking centre differential which, when engaged prevents the flexible division of drive between the front and the rear axles (b, Figure 4). So, as long as either the front or the back axles have decent grip, forward propulsion can be maintained. Suddenly that patch of ice isn’t so much of a big deal. However, if you’re really unlucky, one of the wheels on both the front and the rear axles could be on a slippery patch, and we’re stuck yet again through the action of a spinning rear wheel (c, Figure 5). To get over this problem, modern vehicles are usually fitted with electronic traction control system. Traction control systems prevent drive from escaping from a spinning wheel by applying the brakes to that wheel. If the brakes are on, the easiest route for the drive to travel is to the wheel on the high grip surface, thus forcing the car to continue moving. Alternatively, some hard-core off-road machines have front and rear locking differentials. With both these solutions we now have a robust four wheel drive powered car which can cope with a variety slippery conditions without getting stuck – phew! 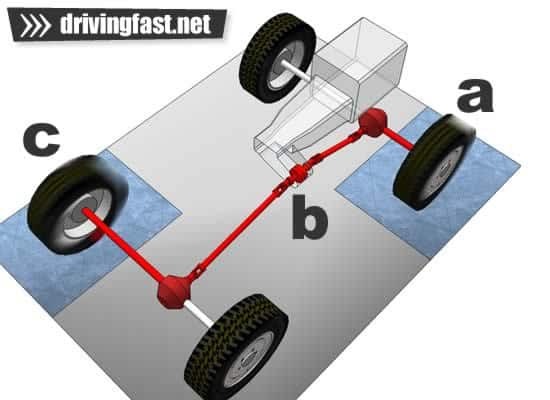 The mechanics of a vehicle with selectable 4WD are quite similar to that of a permanent four wheel drive system, this includes a method of splitting the drive to the front and rear (a), and some differentials at each axle (b and c) to split the drive again for the wheels. 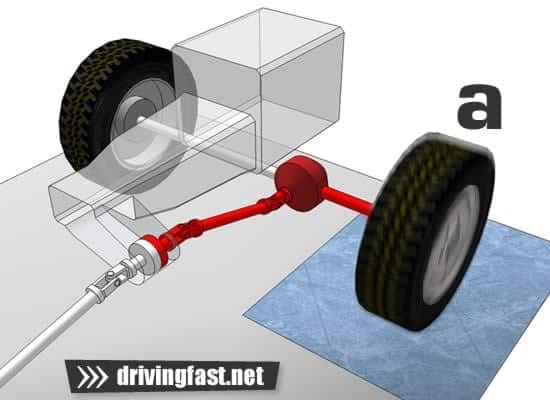 Both manually and automatically selected for 4WD systems operate using the same principle – drive is permanent at one axle (usually the rear), and the other axle can be connected to the engine when required. The ethos of selectable four wheel drive is to engage four wheel drive only when conditions get tricky. This can be done manually via a switch or button, or automatically via some clever technology. The mechanism of connecting an additional axle to the engine can be done in a variety of different ways such as via clutch plates, viscous couplings, or other clever means. Depending on the vehicle you’re driving, this can be done on the move or in some cases the car must be stationary – read your handbook to find out how your system operated. Note: Most selectable four wheel drive systems do not have a centre differential, which means they shouldn’t be used in high traction conditions with 4WD engaged. Doing so may put unnecessary strain on the drive line when turning corners.